This post was co-authored with Anne T. Coughlan, Polk Bros. Chair in Retailing and Professor of Marketing, Kellogg School of Management, Northwestern University and Sylvia Yang, Senior Consultant, Deloitte LLP. Today’s consumers want more, they want it now, and they want it anywhere. In response to changing consumer search and purchase behaviors, companies have adjusted their marketing channel strategies. Traditional models, such as selling consumer packaged goods using retailers or cars through dealerships, do still hold, but reliance on channel partnerships has declined. Results from the February 2017 CMO Survey show that the use of channel partners to reach end users has dropped from 71% in 2013 to 56% today. The appeal of direct-to-consumer sales includes owning the entire customer relationship and controlling access to customer data. Despite these benefits, channel partners retain a vital role for many companies. Managed effectively, channel partnerships either enhance benefits to end users and/or reduce the costs of running the channel. According to Anne Coughlan and Sandy Jap in their new book, A Field Guide to Channel Strategy, an effective channel strategy serves end consumers in terms of how and when they prefer to purchase—not just what they want to purchase—through an infrastructure that provides the necessary functions and benefits at the lowest cost to the company. 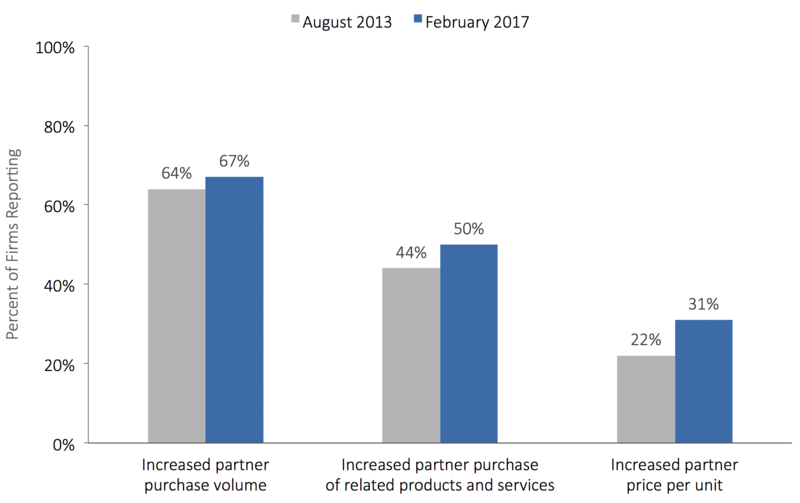 Interestingly, survey results indicate that the companies still using channel partners are gaining more value from these relationships, with the volume, scope, and price paid by partners on the rise over the last four years (see Figure 1). This trend toward greater leverage with channel partners may be occurring precisely because more firms are going direct to consumers, thus putting pressure on channel partners to increase their value in the supply chain. These trends suggest that traditional wholesalers, distributors, and retailers are more likely to stay relevant if they are able to shift from transactional and price-focused relationships to an emphasis on collaboration and value-added services. What forms might these value-based relationships take? We outline 12 benefits of marketing channel partners—seven on the demand side and five on the cost side. Increase demand by offering a broad assortment: Etsy offers an online marketplace where artisans sell their products to consumers looking for a one-of-a-kind purchase. While each artisan produces only a few SKUs, selling on Etsy allows them to position products within a vast and varied marketplace of handmade offerings. An Etsy survey found that 39 percent of its sellers are located in rural areas (compared to just 21 percent of the overall United States population). For these sellers, placing their products in a universally available, variety-rich marketplace helps them connect with consumers who would otherwise be out of reach. Improve customer loyalty: Introduced in April 2015, Amazon’s Dash Buttons collapse the purchase funnel into a two-step process involving need awareness and purchase. For CPG companies seeking to reach convenience-focused consumers, partnering with this Amazon program offers an effective way to satisfy those customers’ needs. With the click of the Dash Button, consumers resupply their homes or businesses with a specific product, bypassing consideration of other brands. In two years, more than 300 brands have utilized Dash Buttons as a part their Amazon strategy. Reach current customers in different usage contexts: Chocolatier Ghirardelli operates a handful of company stores selling chocolate and ice cream delights. However, the company primarily relies on retail partnerships to distribute its products, tailored for special occasions. Whether as a packaged memento from duty-free shops at airports or as a bag of guilty indulgence from the local grocery store, offering its products in a range of sizes and outlets allows Ghirardelli to use its distribution partners to serve customers where they are with what they want. Similarly, Coca-Cola recognizes that consumers get thirsty in many different places and their demand for a refreshing beverage is immediate—after sports, on the road, in the office. It therefore uses multiple channel partner types to reach the consumer not just with the product she wants, but when and how she wants to consume it—“at the point of thirst.” This means going beyond grocery outlets to distribute through vending machine companies, athletic and sports venues, schools, and workplaces. Reach new customers: DoorDash, an online and app-based platform with its own delivery drivers, provides delivery services for restaurants. This partnership lets restaurants focus on their core competency of meal preparation, and DoorDash also provides them with an extended online presence to better reach and cater to the consumer segment that prefers an eat-at-home experience to dining out. In a less conventional example of reaching new customers, the British non-profit organization ColaLife sought to distribute its anti-diarrhea kits in developing countries to reduce child mortality. In a novel channel arrangement, ColaLife delivered the life-saving product to rural villages by packing it inside the Coca-Cola’s crates already being delivered there. Although no longer using the arrangement, the distribution knowledge ColaLife gleaned enabled it to develop other partnerships to travel the last kilometer to reach these distant customers who are unable to travel to clinics or larger towns where medicines are available. Offer firm segmentation and targeting options: Sellers often need multiple channels to reach different buyer segments. Audio equipment manufacturers like Yamaha, Denon, and Klipsch want to reach both the high-end, home-theater buyer as well as the price-conscious, self-installation customer. To do so, they choose two different channels—upscale home theater retailers and retailers like Fry’s that service the do-it-yourselfer—that provide a distinctive product mix, channel benefits, and pricing tailored to each distinct segment. Create promotional benefits: When fashion designer Lilly Pulitzer created a one-time collection for Target in spring 2015 at affordable price points, Target sold out within 24 hours and Lilly Pulitzer’s web traffic spiked to Cyber Monday levels. This temporary promotional effort drove customers to the store in a time when brick-and-mortar retailers face diminishing foot traffic, reinforced Target’s image of “Expect more. Pay less,” and extended the Lilly Pulitzer craze to a more price-sensitive consumer segment. Provide customer service: Manufacturers selling technically-complex products must contend with the user error of inexpert consumers. In technology, Best Buy’s Geek Squad is staffed with Best Buy employees who travel to the customer’s home (for a fee) to install manufacturer-branded products or provide post-sale service. In apparel, Nordstrom’s personal stylists provide shoppers with trusted advice, assembling outfits from customers’ favorite in-store designers to create the best looks of the season. In turn, this service benefits the manufacturers whose products are selected for consideration. Distribute to customers at a lower cost: Obtaining reach and scale in distribution demands significant investments of time and money. Local farmers who partner with Sysco solve food distribution challenges and benefit from immediate increases in demand. Although producers’ margins may be lower, partnering with a national distributor saves the marketing and infrastructure costs required to reach the larger customer base independently. Reduce customer acquisition costs: National channel partners can offer access to local customers at a lower cost. The FTD network benefits independent florists who receive orders placed on ftd.com for local delivery. The online order connects the florist with a local customer, complete with contact information. This is more cost-effective for the florist than running independent advertisements. Reduce channel costs by centralizing channel functions: Red Hat and Microsoft set aside a rivalry to support the Red Hat Enterprise Linux (RHEL) operating system on Microsoft Azure (Microsoft’s enterprise grade cloud computing platform) in response to customer demand. Because end customers have individual preferences for platforms and operating systems, this cooperation to support interoperability allowed combinations that best met customer’s needs and, in turn, increased the value offered by Red Hat and Microsoft. To further increase value, Red Hat and Microsoft built an integrated customer support team comprised of engineers from both companies to serve their common customers. Enable entrepreneurship while controlling costs: Direct selling (DS) firms like Pampered Chef, Amway, and Mary Kay shoulder many business functions for would-be entrepreneurs. These include new product development, branding, ordering/payment, sales training, compensation management, and risk management. The end result is low-cost entry to starting a new business for the independent distributors. Conversely, the DS firm controls its marketing costs by spinning off promotional selling and sales management functions to the DS distributor, who is responsible for relationship management in the retail selling function as well as recruitment and mentoring of new distributors. As with any relationship, creating value-added marketing channel partnerships takes time and investment. But if done correctly, channel partnerships can create strategic advantages for both companies. Even in today’s world of increasing direct-to-consumer operations, channel partnerships retain a crucial role in effectively serving markets.